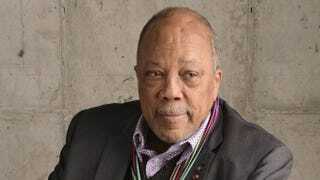 Music Producer and documentary subject Quincy Jones from 'Keep On Keepin' On' poses for a portrait. Quincy Jones is not a fan of the new Michael Jackson Xscape album; in fact, he believes the album only came out because there's still money left in the Michael Jackson brand. During an interview on the Canadian radio show Q with Jian Ghomeshi, the producer extraordinaire, who worked on several of Jackson's biggest hits including, Thriller, Bad and Billie Jean, told the host that: "they're trying to make money, and I understand it." "Everybody's after money, the estate, the lawyers. It's about money," Jones said about Jackson's posthumous album. "It's not my business anymore." Jones also said that when working on Thriller he didn't ask Michael's advice on anything and as the producer he had to take the lead. "What am I gonna learn from Michael? I don't wanna be singing and dancing," Jones said. "I didn't ask him about anything. We told him what songs he was gonna sing. A producer has to do that." Read more at Q with Jian Ghomeshi.